The Writers Content Transfer of Copyright Agreement is used to transfer the copyright to another party. This agreement is designed for content writing for work performed for a publisher such as articles, columns, forms, etc. proposals a few years back and it was great to have a template to remind me of the critical components that needed to be included. The kit helps to win business, but at the same time it helps to protect my business by including the critical contractual components of the proposal." This Writers Transfer of Copyright Contract is included in editable Word format that can be customized in Word or by using the included Wizard software. 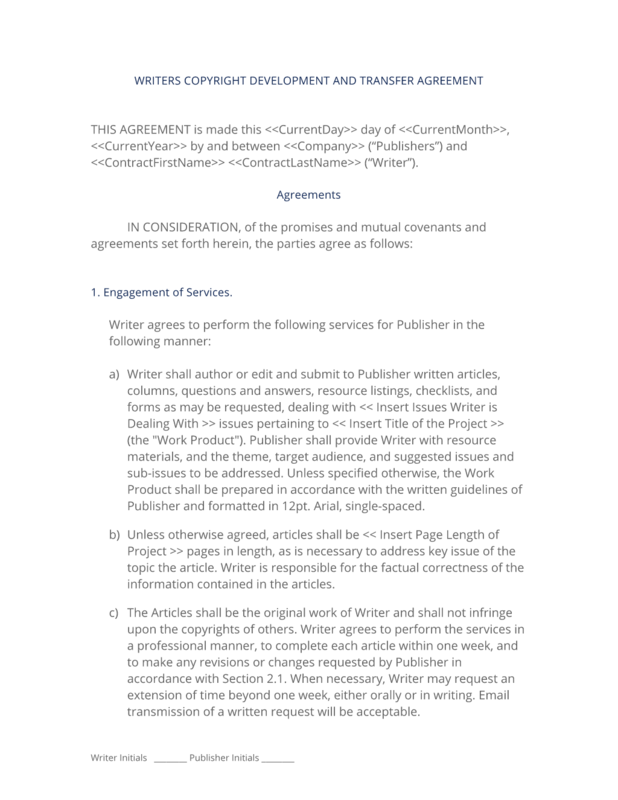 THIS AGREEMENT is made this Current Day day of Current Month, Current Year by and between Company Name ("Publishers") and First Last ("Writer"). Writer shall author or edit and submit to Publisher written articles, columns, questions and answers, resource listings, checklists, and forms as may be requested, dealing with Insert Issues Writer is Dealing With issues pertaining to Title of the Project (the "Work Product"). Publisher shall provide Writer with resource materials, and the theme, target audience, and suggested issues and sub-issues to be addressed. Unless specified otherwise, the Work Product shall be prepared in accordance with the written guidelines of Publisher and formatted in 12pt. Arial, single-spaced. Unless otherwise agreed, articles shall be Insert Page Length of Project pages in length, as is necessary to address key issue of the topic the article. Writer is responsible for the factual correctness of the information contained in the articles. The Articles shall be the original work of Writer and shall not infringe upon the copyrights of others. Writer agrees to perform the services in a professional manner, to complete each article within one week, and to make any revisions or changes requested by Publisher in accordance with Section 2. When necessary, Writer may request an extension of time beyond one week, either orally or in writing. Email transmission of a written request will be acceptable. Writer may not subcontract or otherwise delegate their obligations under this Agreement without Publisher's prior written consent. Writer has the right to refuse any and all assignments. Writer will submit authored and edited Work Product to Publisher via email, and will converse via email, telephonically or in-person as necessary regarding the same. Publisher will pay Writer the fee of Fixed Rate per page for main body of original written text, questions and answers, columns, and checklists. Writer will not be reimbursed for any expenses incurred in connection with the performance of services under this Agreement, unless Publisher approves those expenses in advance and in writing. Publisher will review the Work Product within five (5) business days after receiving it from Writer to ensure that it meets the requirements stated in Section 1. If Publisher does not give written notice of rejection or requests for modification within that time period the Work Product will be deemed accepted. Publisher will pay Writer for the services and will reimburse Writer for previously approved expenses, within ten (10) business days of acceptance. Publisher and Writer understand, acknowledge, and agree that Writer's relationship with Publisher will be that of an independent contractor and nothing in this Agreement is intended to or should be construed to create a partnership, joint venture, or employment relationship. Trade Secrets and Confidential Information. Writer represents that their performance of all of the terms of this Agreement does not and will not breach any agreement to keep in confidence proprietary information, knowledge or data of a third party and Writer will not knowingly disclose to Publisher, or induce Publisher to use, any confidential or proprietary information belonging to third parties unless such use or disclosure is authorized in writing by such owners. Writer agrees during the term of this Agreement and thereafter to take all steps reasonably necessary to hold in trust and confidence information which they know or has reason to know is considered confidential by Publisher ("Confidential Information"). Writer agrees to use the Confidential Information solely to perform the projects hereunder. Confidential Information includes, but is not limited to, technical and business information relating to Publisher's products, research and development, processes, and future business plans. Writer's obligations with respect to the Confidential Information also extend to any third party's proprietary or confidential information disclosed to Writer in the course of providing services to Publisher. This obligation shall not extend to any information that becomes generally known to the public without breach of this Agreement. This obligation shall survive the termination of this Agreement. "Work Product" means the works of authorship conceived or developed by Writer while performing the project services under this Agreement and prior works described in Section 8 of this Agreement. Writer hereby irrevocably assigns, conveys, and otherwise transfers to Publisher, and its respective successors and assigns, all rights, title and interests worldwide in and to the Work Product and all copyrights, contract and licensing rights, and claims and causes of action of any kind with respect to any of the foregoing, whether now known or hereafter to become known. In the event Writer has any rights in and to the Work Product that cannot be assigned to Publisher, Writer hereby unconditionally and irrevocably waives the enforcement of all such rights, and all claims and causes of action of any kind with respect to any of the foregoing against Publisher, its distributors and customers, whether now known or hereafter to become known and agrees, at the request and expense of Publisher and its respective successors and assigns, to consent to and join in any action to enforce such rights and to procure a waiver of such rights from the holders of such rights. In the event Writer has any rights in and to the Work Product that cannot be assigned to Publisher and cannot be waived, Writer hereby grants to Publisher, and its respective successors and assigns, an exclusive, worldwide, royalty-free license during the term of the rights to reproduce, distribute, modify, publicly perform and publicly display, with the right to sub-license through multiple tiers of sub-licenses, and the right to assign such rights in and to the Work Product including, without limitation, the right to use in any way whatsoever the Work Product. Writer retains no rights to use the Work Product except as stated in Exhibit A and agrees not to challenge the validity of the copyright ownership by Publisher in the Work Product. Writer shall receive Name Recognition as author on all articles and columns. Recognition will be clear and conspicuous. In the event that Publisher assigns or licenses said articles or columns to any third party(ies), Publisher will use their best efforts to ensure Writer receives proper Name Recognition. Insert the writers copyright to be included in the project. Writer shall have final review of their Work Product before publishing. If Writer finds the finished Work Product to be unsatisfactory, Writer may choose not to receive Name Recognition in accordance with Section 5. Writer agrees to assist Publisher in any reasonable manner to obtain and enforce for Publisher's benefit copyrights covering the Work Product in any and all countries. Contractor agrees to execute, when requested, copyright, or similar applications and assignments to Publisher, and any other lawful documents deemed necessary by Publisher to carry out the purpose of this Agreement. Writer further agrees that the obligations and undertaking stated in this Section 5.5 will continue for one year after the termination of this agreement beyond the termination of Writer's service to Publisher. If called upon to render assistance under this Section 5.5, Writer will be entitled to a fair and reasonable fee in addition to the reimbursement of authorized expenses incurred at the prior written request of Publisher. In the event that Writer is unable for any reason whatsoever to secure Writer's signature to any lawful and necessary document required to apply for or execute any copyright or other applications with respect to any Work Product, Writer hereby irrevocably designates and appoints Publisher and its duly authorized officers and agents as his or her agents and attorneys-in-fact to act for and in their behalf and instead of Writer, to execute and file any such application and to do all other lawfully permitted acts to further the prosecution and issuance of copyrights or other similar rights thereon with the same legal force and effect as if executed by Writer. The Work Product was created solely by Writer, their full-time employees during their employment, or independent contractors who assigned all right, title and interest worldwide in their work to Writer. Writer is the owner of all right, title and interest in the tangible forms of the Work Product and all intellectual property rights protecting them. The Work Product and the intellectual property rights protecting them are free and clear of all encumbrances, including, without limitation, security interests, licenses, liens, charges or other restrictions. Writer has maintained the Work Product in confidence. The use, reproduction, distribution, or modification of the Work Product does not and will not violate the rights of any third parties in the Work Product including, but limited to, copyrights, trade secrets, trademarks, publicity and privacy. The Work Product is not in the public domain. Writer has full power and authority to make and enter into this Agreement. Writer agrees to defend, indemnify, and hold harmless Publisher, their officers, directors, sub-licensees, employees and agents, from and against any claims, actions or demands, including without limitation reasonable legal and accounting fees, alleging or resulting from the breach of the warranties in Section 6. Publisher shall provide notice to Writer promptly of any such claim, suit, or proceeding and shall assist Writer, at Writer's expense, in defending any such claim, suit or proceeding. The Parties acknowledge that prior to this Agreement, Writer has submitted to Publisher Work Product created as a writing sample. Writer hereby irrevocable assigns conveys, and otherwise transfers to Publisher, and its respective successors and assigns, all rights, title and interests worldwide and all copyrights in and to said work, and makes all warranties as set forth in Section 6 of this Agreement with respect to said work. This Agreement contains the entire agreement between the parties hereto with respect to the rendering of services by Writer for Publisher, and supersedes any prior agreements, either written or verbal. Any modification of this Agreement will be effective only if it is in writing signed by both parties. This Agreement will be governed by and construed in accordance with the laws of the State of State. Both parties agree that they will act in good faith in all matters concerning this Agreement, and that all terms of this contract are to be interpreted reasonably and in a fair and equitable manner. This agreement may be terminated by either party, for any reason, with or without cause, upon thirty (30) days written notice. Nothing in this agreement shall require Publisher to assign any specific number of assignments nor shall this agreement obligate Writer to accept any specific assignments. The purpose of this agreement is to govern the payment schedule and the rights and responsibilities of the parties for work assignments accepted by Writer. Each party looks forward to a mutually enjoyable relationship with the other. However, should any controversy or claim arise out of and/or relating to this contract or breach thereof, which is not settled between the signatories themselves, the same shall be settled by arbitration in accordance with the Rules of the American Arbitration Association. Arbitration hearings shall take place in City, State. Judgment on the award rendered by the arbitrator(s) may be entered in any court having jurisdiction thereof, including the award to the aggrieved signatory/signatories, their heirs, assignees, and/or designees, for the total remuneration received as a result of business conduct with the parties covered by this Agreement, plus court costs, attorney's fees, and other charges and damages deemed fair by the arbitrator(s). THE PARTIES ACKNOWLEDGE THAT THEY ARE AWARE OF THE FACT THAT BY AGREEING TO ARBITRATE THEY WAIVE ANY RIGHT THEY HAVE TO A COURT OR JURY TRIAL. The complete Writers Transfer of Copyright Contract - with the actual formatting and layout - is available in this Contract Pack.